On July 10, 1922, Clara Phillips visited the hardware department of a local five-and-dime store. She picked up a 15-cent hammer and weighed it in her hand for a moment before turning to the clerk to ask if he thought it was heavy enough to kill a woman with. The clerk, thinking that this was a joke, replied, “Yes, it is, if you hit her hard enough with it.” Clara bought the hammer. The day after she’d purchased the suitable-for-slaying tool, Clara, a former chorus girl and film extra, spent her afternoon in a Long Beach speakeasy with a friend, another ex-chorine, Peggy Caffee. Clara told Peggy back-fence gossip she’d heard that hinted at an affair between her husband, Armour, and an attractive widow, Alberta Meadows. By the end of the day Clara had formulated a plan to eliminate her rival. Fabricating a story of needing a lift, Clara and Peggy caught a ride with an unsuspecting Alberta. On a secluded stretch of Montecito Drive, Clara asked Alberta to pull over for a private conversation; she then brought the 15-cent hammer down on Alberta’s head and battered her until the weapon broke. For the coup de grace Clara rolled a 50-lb boulder onto her victim’s chest. Peggy witnessed the horrific crime from the car, and not wanting to end up like Alberta, she took Clara’s advice and kept her mouth shut. Clara went home drenched in Alberta’s blood and announced to Armour: “I guess it’s murder.” She smiled and told him that she was going to cook him the best dinner he’d ever had because she was so happy. On the morning following the Best Dinner He’d Ever Eaten, Armour put his wife on an eastbound train and then went to the cops and spilled his guts. Clara was busted in Albuquerque and returned to Los Angeles, where she was greeted by throngs of reporters and photographers. She’d been dubbed “Tiger Girl” for the brutality of her attack on Alberta. Clara was tried and found guilty of second-degree murder. On December 5, 1922, it was reported that Clara had escaped from the county jail by cutting the bars of her cell, hoisting herself onto the roof of the building, and then shimmying down a drain pipe. The truth is Clara bribed a Sheriff’s Deputy with either cash or favors to unlock her cell door and turn a blind eye. Clara was on the lam for over four months before she was discovered hiding out in Tegucigalpa, Honduras. She was arrested and extradited to California, where she began serving her sentence at San Quentin. 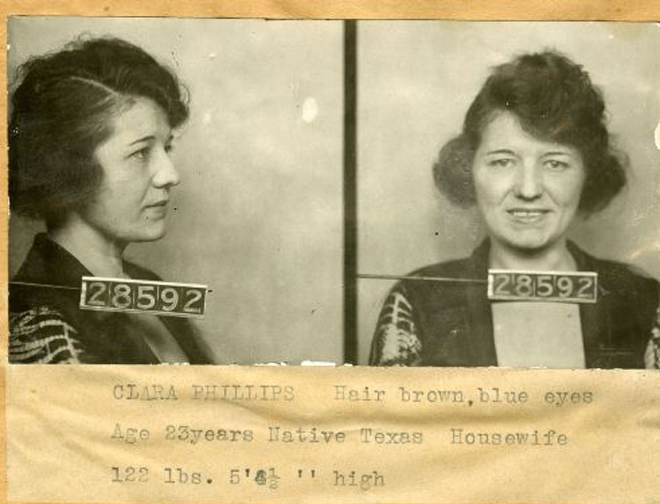 When Clara came up for parole in the spring of 1935, the upstanding citizens of California were not happy, but there wasn’t a thing they could do about it. She had been promised a guaranteed parole date when she agreed not to fight her extradition from Honduras. Clara would have been released earlier, but she had lost some time for penning lewd love notes to Thomas J. Price, a young convict working as an electrician. By the time of her release Clara had divorced Armour, the man for whom she had committed murder. She told reporters that she was going to move to San Diego with her family to work as a dental assistant, a trade she’d learned in prison. Joan Renner is a writer, lecturer, and social historian with an expert knowledge of Los Angeles-based murders, corruption, and scandals. She blogs at Deranged L.A. Crimes.